Posturely lumbar support pillow is perfect for everyday use in providing orthopedic lower back pain relief. -SOFT density premium support cushion is extremely comfortable and forgiving, providing a great combination of comfort and lower back support with just the right amount of give. -MEDIUM density cushion is comfortable while offering moderate back support with a touch of added firmness within the padding. Perfect choice for anyone looking for softness with support. -FIRM density offers maximum lower back support while retaining a comfortable padded feel. The ideal choice for those in need of maximum back support. Free bonus extension strap allows you to use your lumbar cushion with recliners and large chairs. -Essential for computer operators, computer and console games players, anyone who drives, back pain sufferers, etc. Guarantee: Your satisfaction is our #1 priority, we stand behind each of our memory foam lumbar support cushions with a no questions asked customer satisfaction 100% money back guarantee! Scroll up and click the ADD TO CART Button at the Top of this page and take the first step to lower back pain relief today! 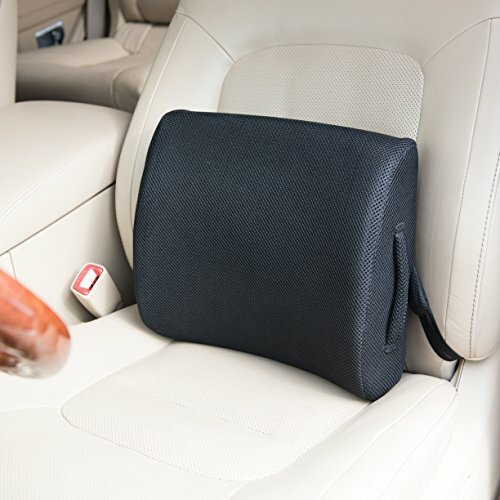 LOWER BACK PAIN RELIEF - 100% Comfort Premium quality memory foam pillow is perfect for anyone seeking to sooth lower back pain while driving in your car, working in an office chair, or relaxing in your favorite recliner. Offers 3 densities of memory foam to support your lower back and promote healthy posture. Relieves and alleviates pain from back aches, muscle aches, arthritis, herniated disks and sore backs in general. ADJUSTABLE STRAP WITH BONUS EXTENSION and E-GUIDE: Keeps the back support cushion in place and prevents it from slipping down, heavy duty clips are built to last and the bonus extension strap works with any office chair, computer chair, gaming chair, executive chair, couch, car seat, SUV seats, truck seats, and recliner seat. Downloadable e-Guide offers helpful tips for reducing back pain. If you have any questions about this product by Posturely, contact us by completing and submitting the form below. If you are looking for a specif part number, please include it with your message.